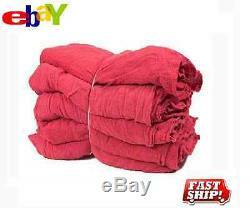 1000 MECHANICS RAG SHOP RAGS TOWELS RED LARGE 13X14 GMT BRAND HEAVY DUTY. WE ARE PROUD TO PRESENT: GEORGIA MILLS. TEXTILE MANUFACTURING BRAND "GMT"- HEAVY WEIGHT, HEAVY DUTY&##xA0. INDUSTRIAL, &###xA0;RED SHOP MECHANICS RAGS/ TOWELS. RAGS ARE STANDARD SIZED 160# WEIGHT. AND ARE PRE WASHED & PRESHRUNK. FROM 16''X16'' TO 13''X14. THESE TOWELS ARE MADE OF 100% COTTON&###xA0;OSNABURG FABRIC. AND ARE HEMMED ON ALL FOUR SIDES FOR ADDED STRENGTH AND DURABILITY. GUARANTEED WEIGHTS NO STAINS OUR TOWELS ARE NEW AND NEVER!! USED UNLIKE OUR COMPETITORS READ THE FINE PRINT! Frequently used for Wiping Spills, Grease, Oil, Tools, Grime and Fluids. For use in Industrial Facilities, Factories, Machine Shops, Garages, On The Job, Auto Centers and Home Garage. Never Used or Recycled COMPARE OUR COLOR AND QUALITY TO COMPETITION WE ARE THE LARGEST SHOP TOWEL AND COMMERCIAL LAUNDRY EXPERTS IN THE USA SHOP WITH US IN CONFIDENCE! THESE ARE AN EXCELLENT ADDITION TO&###xA0;ANY COMMERCIAL SHOP, OR USE THEM AT YOUR HOME GARAGE AND CLEAN UP LIKE A PRO! DON'T BE FOOLED BY OTHERS... READ THE FINE PRINT- OURS ARE BRAND NEW! BUSINESS SUPPORT YOUR LOCAL AMERICANS. &###xA0;&###xA0;&###xA0;&###xA0;&###xA0;&##xA0. PLEASE VISIT OUR E-BAY STORE Georgia Towels FOR OTHER ITEMS LISTED AT WHOLESALE BARGAIN PRICES! Powered by The free listing tool. List your items fast and easy and manage your active items. Georgia Towels is an Atlanta, Georgia based company with over 45 years of experience, service, and reliability in the commercial textile industry. We are an American Family Owned and operated, small business, promoting female ownership, management, and a diverse friendly staff! We have deeply embedded roots in the textile industry in the US. From prior generations cultivating cotton crops on the farm, to working a sewing machine at 1888 Mills here in Griffin, Georgia in the 1950's, to our current presence in the manufacturing, distributing, and online community today. Textiles are in our blood sweat and tears. We believe hard work, a little southern hospitality, and the golden rule, are ways of life to live by! About a decade ago, we decided there was a need for change in the market. For so many years, our items were only available to commercial accounts, in large wholesale lots. We realized there was a need for small businesses and individuals to gain access to quality industrial textiles at affordable pricing as well. Why should a local hair salon have to overpay for their towels in a retail environment? We decided savings, and the true need for value in an everyday commodity should be available to everyone, especially small businesses that keep America thriving these days! &###xA0;So here at Georgia Towels, we're able to cut costs by cutting out the middle man- a distributor, and have instead opted to sell directly to the consumer and pass on the vast savings. Trust that Georgia Towels is here for you with whatever your textile needs should be! With our nearly half a century of experience, we're able to leverage our connections and experience within the industry to attain and provide the latest manufacturing equipment and top facilities to maximize productivity and quality standards, providing a high quality product, with an exceptional value and price! Because we control our own product development as well as the manufacturing process, we're able to guarantee results. Our friendly staff is here to help guide you every step of the way. We thank you for your business and support! Please note the provided carrier in the listing details may not be the best fit for your particular location or situation, therefore we reserve the right to use an alternate carrier or service when needed. If you do not see a carrier scan, please do not panic. Not all services offer day by day, or location by location tracking. We are confident that you will be satisfied with the product and value received by Georgia Towels! However we do understand that there may be exceptions to any situation. We strive for accuracy with every fulfillment, however mistakes do happen sometimes. We will rectify any situation you may encounter! If you have decided that you simply do not like the item or no longer need it, we will be happy to acept your return. "Hotel" Descriptions- We are wholesale manufactureres and distributors of commercial textiles. Commercial textiles are not the same as retail items. When we advertise items as "hotel" grade, this is not a sales gimmick, it is a factual statement. Hotel towels are thinner and lighter weight than that of a retial consumer. This is because hotels have a high turn over rate as well as a necessity to launder linens quickly. Thick towels take much longer to wash and dry, and recirculate throughout the facility. Items Sizes, Weights, and Shrinkage- Llisted items sizes and weights are estimates, and may not be exact. Our items are man made, and subject to variances. Sheeting is advertised in "cut sizes", not finished sizes, therefore will vary. Any items containg any percentage of cotton content will shrink once laundered. The extent of shrinkage cannot be determined, and often varies based on your personal care preferences and machine settings. With retaill textile products, they are prewashed and prepped prior to arriving to the stores. However our items are not. This means that upon the first initial washes, you will see an excessive amount of lint/ fuzz/ shedding in comparrison. Think about the mill these towels are made in, and the amount of excess fibers and particulates in the air alone. These particles stick to the items, there are waste fibers embedded in the weaving. All of this will be visible initially, but will subside. This is not an indication of the towels "falling apart" in any way. It is to be expected. Item Condition and Packaging- Because we are commercial distributors, the majority of our items arrive to you starched and compressed. This is standard practice within the industry. This means items may have a stiff rigid feel. We are able to fit a larger product into smaller packaging, which then saves you- the end user, on final cost of products. We utilize poly bags, paper envelopes, and cardboard boxes. We cannot guarantee which of these your items will arrive in. Becuase we are not retailers, we do not offer items in retail type packaging. Your items may, or may not arrive in plastic wrapping of some kind. Our items are not in retail packaging. This listing is currently undergoing maintenance, we apologise for any inconvenience caused. The item "1000 mechanics rag shop rags towels red large 13x14 gmt brand heavy duty" is in sale since Wednesday, June 15, 2016. This item is in the category "Business & Industrial\Cleaning & Janitorial Supplies\Manual Cleaning Equipment\Rags, Towels & Wipers". The seller is "georgiatowels" and is located in Ellijay, Georgia. This item can be shipped to United States, Canada.